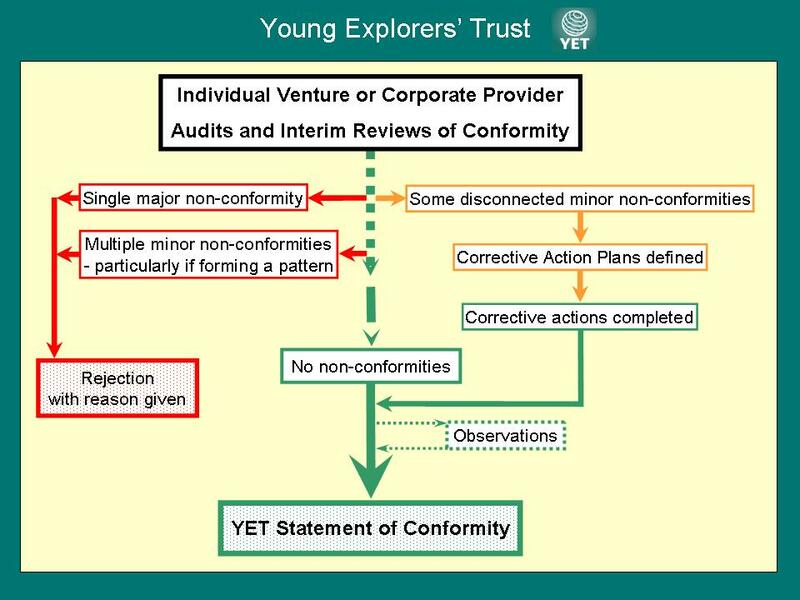 The Young Explorers’ Trust (YET) was formed in 1972, when it undertook to provide services to youth expeditions. Prime amongst these was its Approval Scheme for youth expeditions overseas, together with Grant Aid for some expeditions. The YET Approval and Grant Aid Scheme has been in operation now for over 35 years, during which time around 1500 individual overseas youth expeditions, and very many more through the more recently introduced corporate Evaluation Service, have had their plans screened by the Trust. YET champions and generally promotes the use of good practice in adventurous activities so that young people can experience the pleasures and values of expeditions without undue risk to their safety and general wellbeing. When doing so, it has to be recognised that adventurous activities, by their very nature, involve exposure to accepted elements of risk, challenge and adventure greater than those normally encountered in everyday life. YET is keen to see that all ventures of this nature follow high standards of conduct and are undertaken responsibly and as safely as practicable. It cannot be guaranteed however that all possibility of resultant injury to participants, or others, is eliminated. YET views any assessment process of a venture, not as a further restriction on risk and the development of young people, but as an enabling one that raises the standard of operation across the whole sector. It promotes participant (and parental) confidence and brings greater opportunity to enable the benefits of the expedition experience to reach a wider audience of young people. YET does not organise expeditions, but offers its skilled services, including mentoring to voluntary youth groups, to schools, to all venture providers (voluntary and commercial), to Scouts / Guides / cadets and other uniformed groups, and to all other groups involved in providing challenging and adventurous ventures outside the UK for young people. In 2007 the British Standard BS 8848 — a specification for the provision of visits, fieldwork, expeditions and adventurous activities outside the UK was published. It provided a recognised benchmark against which to assess the acceptability of safety and general good practice on overseas expeditions. YET re-structured its existing and widely respected approval scheme in line with this standard to enable providers of such ventures to demonstrate Conformity to BS 8848 through the YET Evaluation Service. In 2009, the British Standard was revised and YET adjusted its procedures to enable either the evaluation of individual ventures, or the assessment of providers on a corporate basis, for Conformity to BS 8848. For corporate conformity, a key requirement is that the Venture Provider has to ‘self assess’ all ventures it provides and declare that individually they do so conform to BS 8848. In 2014, a new version of British Standard BS 8848 was published. This covers all aspects of provision considered in earlier versions, but with greater emphasis on the nature of evidence required to demonstrate conformity. The YET Evaluation Service methodology is continually reviewed and developed to ensure that it is fully in line with the specification of the Standard. The British Standards Institute has also published “A parents’ guide to adventurous activities abroad for young people” which offers information and advice on what is covered by BS 8848 and the reason for its existence. If you have any questions or need further clarification on aspects of the Evaluation process, see the FAQs. If that does not answer your question, contact the Evaluations Co-ordinator by email at evaluations@theyet.org. YET has considerable experience evaluating the plans for the provision of ventures for people aged 14 to 25 but it will also evaluate Conformity to BS 8848 for Venture Providers who operate with a wider age range. Such Providers include, but not exclusively, those offering “adventure tourism”. a community or environmental purpose. Venture Providers use YET as a competent, external and independent “other party” assessor of their Conformity to BS 8848 as laid down in the specification. It is fundamental that all ventures are subject to self-assessment by the Provider in accordance with the requirement of the Standard. YET is not acting, of itself, as the arbiter of the quality of provision, but assesses such provision by the organization against the Standard to give assurance of good management practice in accordance with the specification. YET Evaluation Panels include an ISO 9001 (Quality Systems Lead Auditor) qualified chairman, drawing upon the assistance of subject matter experts and venture activity specialists when considered necessary, and the Evaluation follows an auditing procedure appropriate to the specification laid down in the Standard. the quality of the venture in terms of personal development opportunities that may be achieved through proposed adventure and projects. YET Declaration of Individual Venture Conformity to BS 8848 is appropriate for individual peer-led ventures or schools, charitable, non-profit or commercial organizations running two or fewer expeditions in any year. The declaration pertains solely to the particular ventures assessed over their lifetime from the date of assessment. YET Declaration of Corporate Conformity is normally granted for three years from the assessment date, subject to intermediate checks of conformity, usually annually, at the sole discretion of YET. At all times, it is the clear duty of the Venture Provider to notify YET and all venture participants, leadership teams and any other stakeholders in the venture of any failure of the venture to comply with the requirements of BS 8848. This is to be done in writing within 14 days of the matter becoming known to the provider. All claims of Conformity must also be withdrawn immediately. Who can apply for Evaluation? Any Individual or Corporate Venture Provider may apply for YET Evaluation of Conformity to BS 8848. Providers may be based in the UK or abroad. However, although YET is prepared to advise any provider that seeks its help, it cannot do so for every type of venture outside of the UK. the overall aim of a venture shall be to provide personal development opportunities for the participants, promoting recreation and leisure time activities of an enterprising or exploratory nature so as to develop their physical, mental and spiritual capacities. the venture must take place outside the UK. Individual Venture Conformity of charitable/educational organizations, individual peer-led ventures or small commercial companies operating at a significantly smaller level and planning two or fewer ventures per year. Corporate Conformity of all ventures run by a large organization, be it commercial or otherwise. Declaration of Individual Venture Conformity given by YET pertains solely to the particular ventures assessed over their lifetime from the date of assessment. Declaration of Corporate Conformity is given for a period of three years from the date of assessment. However, it is dependent on satisfactory interim checks by YET of conformity, usually annually, over its lifetime. The fee levied applies to the total Evaluation, whether paid as a lump sum or by instalment, and is not related to interim checks that Conformity is being sustained. Please register your intent to submit an application as early as possible. This will assist in arranging the schedule of interviews. YET fully acknowledges that it takes time to complete the application and to assemble the required documentation. Applications must be made at least 21 days before any proposed interview date. Contact the Evaluations Co-ordinator by email to register your intent to apply with name, venture destination and dates, and preferred date and location for interview. (a request for mentor support may be made at this point if required). All essential information to enable a Venture Provider to understand the YET Evaluation procedure and to complete the appropriate application forms is given in the links below. follow the process instructions below. Complete all sections of the form, inserting or attaching supporting documents. Email full application to the Evaluations Co-ordinator [evaluations@theyet.org]. If any aspects of the above procedure present problems, the Evaluations Co-ordinator may be emailed for advice. Download and study the guidance “YET Evaluation of Individual Venture Plans – Introduction” and “YET Evaluation of Individual Venture Plans – Procedure”. Obtain, by direct request from the Evaluations Co-ordinator, the application form “YET Evaluation of Individual Venture – Application Form”. A flow chart of the key stages and actions in the Individual Venture Evaluation process is available to help understand how YET handles the application process. NOTE: It is appreciated that all details may not be in place at the time of application as planning may still be in progress. The application may be updated, by email, at any time between the application and the interview, or in extremis, brought to the interview. Download and study the guidance “YET Corporate Evaluation procedure”. Obtain, by direct request from the Evaluations Co-ordinator, the application forms “YET Corporate Conformity Workbook – BS 8848:2014” and “YET Sample Venture data form”. Any organization, seeking to make a self-declared claim of Corporate Conformity to BS 8848 for the ventures it provides is ultimately accountable for all aspects, including safety, of ventures provided either on a voluntary basis or in return for payment. Responsibility for providing constituent elements may be delegated (i.e. third party provision). However, accountability for ensuring Conformity to BS 8848 of any delegated elements remains entirely with the Venture Provider. Furthermore, the Venture Provider will be required by YET to ‘self assess’ all ventures it organises and ‘self declare’ their Conformity to BS 8848. The Venture Provider will be required to produce satisfactory evidence to demonstrate how this is undertaken.